Who knew there were Bears fans in London? Well, the NFL found them. The NFL’s audience is expanding overseas, now that the league schedules games in London every year. In Week 4, the Miami Dolphins and New York Jets squared off across the pond at Wembley Stadium. The Dolphins and Jets weren’t the only teams represented in the stands, though. Check out this mosaic post on the NFL’s official Instagram account. 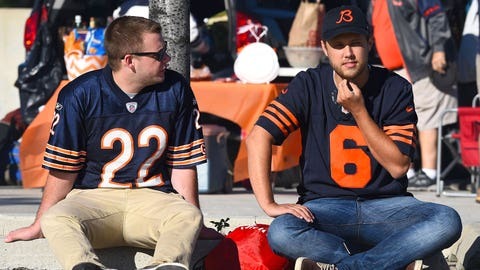 The mosaic features 25 various jerseys spotted in London on Sunday morning, and the Chicago Bears are surprisingly well-represented. Kyle Long’s No. 75 jersey is the only one belonging to a current Bear; there’s also Devin Hester’s No. 23 (now No. 17 in Atlanta) and a unique, split-color Brian Urlacher jersey. The Dallas Cowboys, also known as America’s Team, are the only team with three jerseys featured in the mosaic (Tony Romo, Dez Bryant and Troy Aikman).